Jakob Luke Dylan is the youngest of four children born to singer-songwriter Bob Dylan and ex-wife Sara Dylan. 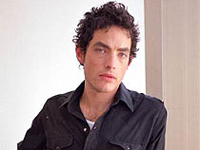 He is best known as the lead singer and songwriter for The Wallflowers. He married married his childhood sweetheart, Nicole Paige Denny (now actress Paige Dylan), in a ceremony at Sara Dylan’s house in 1992. They live in Los Angeles and Pennsylvania. They have four sons: Levi, born in 1994, James in 1998, a third in 2000, and a fourth in 2007. They also have one adopted daughter, Heather who was age 9 when sole custody was granted to the Dylans in 1999. Jakob is very private abouthis family to the extent that there are vitually no images of his children or wife available on the web. The Wallflowers started out playing alongside other aspiring rockers at Canter’s delicatessen in the Fairfax District of Los Angeles. The band signed to Virgin Records and made a self-titled album, the cover of which had a picture of all the band members’ feet, and drummer Peter Yanowitz’s dog. The debut sold poorly however, and after they were released from Virgin Records, the band regrouped. They toured with 10,000 Maniacs, Toad The Wet Sprocket, Cracker, and The Spin Doctors, and gained and lost several band members along the way. With the help of their manager Andrew Slater, the band secured a new major label record deal with Interscope Records. Their 1996 album Bringing Down the Horse, recorded with producer T-Bone Burnett (and including collaborations with Michael Penn, Adam Duritz, Mike Campbell, Don Heffington of Lone Justice, and Sam Phillips), yielded several singles, including “6th Avenue Heartache” and “One Headlight”. The album sold over four million copies, twice as many as his father’s album Blood on the Tracks sold in over 20 years. Burnett stated at the time: “As far as Jakob is concerned, I can’t imagine having larger footsteps to follow in. But Jakob’s character is clearly defined and he handles success with grace, which also says a lot about Bob as a father.” Burnett went on to state that the success of Bringing Down the Horse had nothing to do with the family name: “I don’t think Jakob sold a single record because he is Bob’s son. I think he sold a lot of records because “One Headlight” is a very good song. I wonder how many Wallflowers fans even know who Bob Dylan is.” The Wallflowers won two Grammy Awards, for Best Rock Vocal Performance by a Duo or Group and Best Rock Song. “One Headlight” also won the VH-1 Video of the Year for 1997. On September 20, 2006 it was announced by Billboard that Dylan signed a new recording contract with Columbia Records. The Wallflowers‘ current situation has remained unknown since their recording contract with Interscope Records ended in 2005. Dylan wrote and recorded “Here Comes Now” as the theme song for the U.S. television show Six Degrees, which premiered on September 21, 2006. His song “Stardust Universe” premiered on Jericho on October 25, 2006. A cover of The Band’s “Whispering Pines” appears on the tribute CD Endless Highway – The music of The Band, which was released late January 2007. Dylan also contributed backing vocals to the track, “Black Haired Girl,” on Jesse Malin’s 2007 album, Glitter in the Gutter. Dylan collaborated with Dhani Harrison on the John Lennon song, “Gimme Some Truth,” for the Lennon‘s tribute album, “Instant Karma: The Amnesty International Campaign to Save Darfur”, which was released on June 12, 2007. 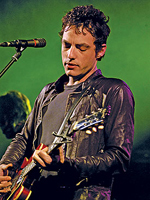 As of early 2007, Jakob Dylan had performed with his father only once, at a corporate gig for semiconductor company Applied Materials on November 14, 1997, although they played the same show, they did not play together. In early September 2007, the New York Times reported Dylan was working on his first solo album in a house in Hollywood Hills owned by famed record producer Rick Rubin. Rubin was also reported to be the producer of the forthcoming album New York Times. On February 20, 2008, Dylan’s MySpace page and official website released information about the album. The album will be called Seeing Things and is scheduled for a release date of June 10, 2008. The mostly acoustic album will contain 10 tracks. The names of these songs was also released at the same time and dozens of news sources picked up the story. For example, one news story which included the track listing was published in NME News on February 21, 2008.